Excuse the horrid lighting and the less than stellar press job. I was in a hurry to get these photographed before I sent them home with the children the morning we left. It is barely daylight outside when I took these photos. All excuses aside. They looked adorable on and I am anxious to see how the family portraits turned out. I used an Italian superfine twill check available from Farmhouse Fabrics. This fabric is a dream. It reminds me of the Spechler-Vogel Sea Island Diamonds I used here. The more you handle it the softer it becomes. Luscious. I modified Children's Corner Louise for Princess. My original thought was to make the insert white for the cherries but decided against it. I have made cherry dresses in the past and have hand embroidered the cherry leaves. This time, I decided to machine embroider them. The cherries themselves are a stuffed yo-yo from pima cotton gingham. The same was used for the piping. Poly cotton Spechler-Vogel pique is used for the collar. I did refrain from piping the armholes. 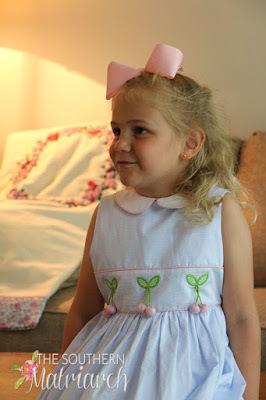 Great style for a young lady who is almost six. Though I am not ready to give up on basic yokes or bishops for her just yet. I may not have piped the armholes but I did extend the piping at the waist to the center back opening. That does mean modifying the order of construction some, but it wasn't difficult. You just have to think through your steps. For LG, I used Children's Corner Kathy/Kelly. I didn't realize until just now, that this pattern is out of print. You can find copies on both eBay and Etsy. I love this pattern. I am sad it is discontinued. People get scared of the pleats but they are not difficult if you just follow it step by step. and Iron, iron, iron as you go. Fabric is the same Italian twill with lined pique for the collar. I almost had a catastrophe on my hands. I didn't measure the pattern length before I started, so it has a much shallower hem than I would prefer. The afternoon after family portraits was busy with party prep so I don't have any photos of LG in her dress and could only find this one of Princess. Even more reason I am anxiously awaiting those family portraits. My goal had been to try them on them before we left to return campers to their parents, alas it wasn't to be. We would have been even later than we were if I had taken time to do that as well before leaving the house. I did not take photos of the boy's garments. 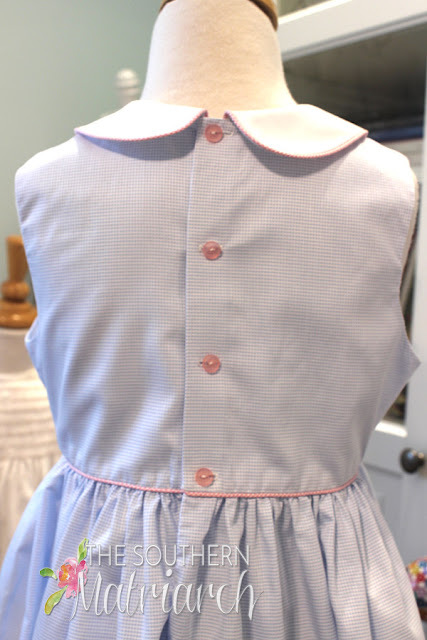 I made Children's Corner Parkers Pants (of course I did) from the blue twill with pink polos. They looked like little southern gentlemen. 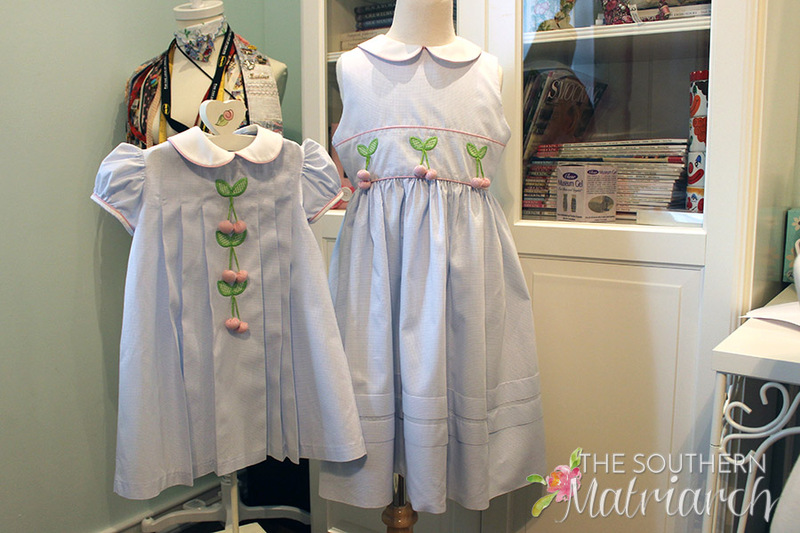 I am sure these are not the last cherry dresses I will do, I just love everything about them. Even more I love the girls in them. 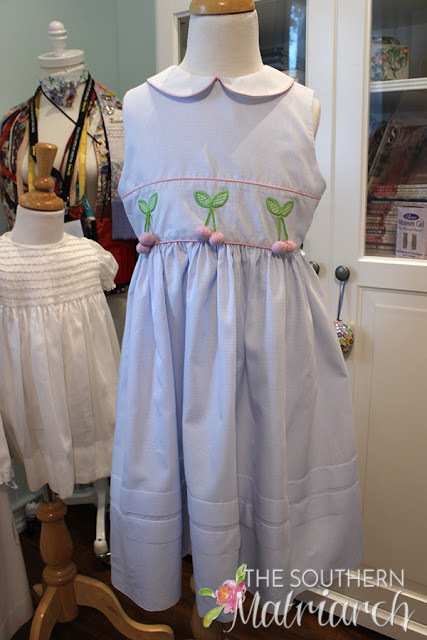 I hope this will inspire you to try your own St. Louis Cherry Dress. 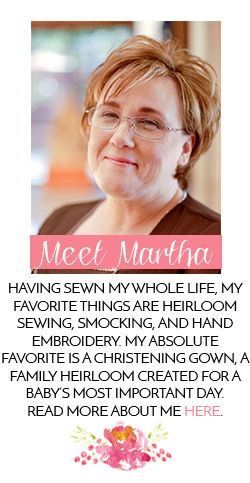 You are amazing, Martha, simply amazing! Gorgeous dresses! Are you entering the Fair this year? You always inspire me to finish up some UFOs to enter. I always love seeing what you are making. 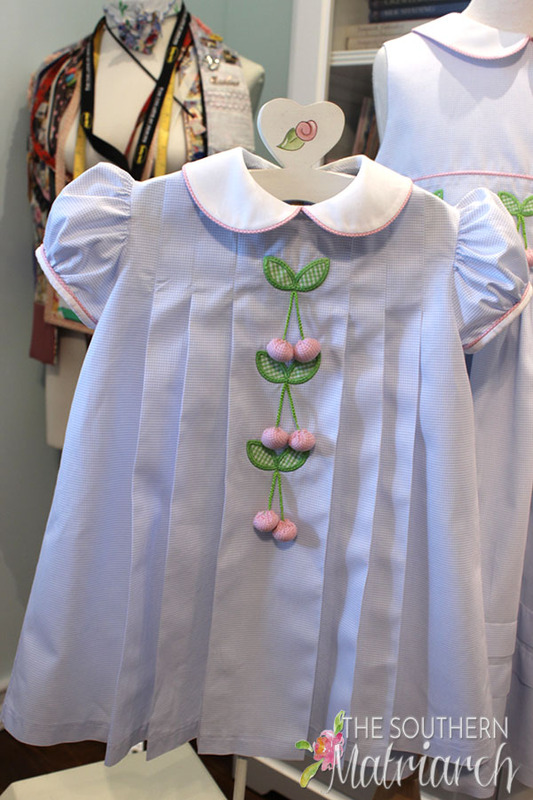 Gorgeous dresses, and exquisitely sewn. Always a pleasure to see what you are doing. Sweeter than real cherries! Kathy/Kelly is a favorite, since I adore pleats. Love your choice of fabrics and soft colors. Fingers crossed for wonderful portraits, so these can be treasured long after those precious grands outgrow them. Martha, Eva Marie is now SIX!?! Although I don't read your blog religiously, and comment even less frequently, but I love it, learn something new each time, and I am grateful for the time and energy you devote to it.